It’s always puzzled me why so many people think of Ecclesiastes as depressing. For me as a teenager, it provided a map for navigating my way out of depression. Of course, I’m not saying it’s a magic cure for mental illness, but if you’re struggling with questions about the meaning of life or frustrated with how pointless it all seems, this book can provide a great deal of hope. 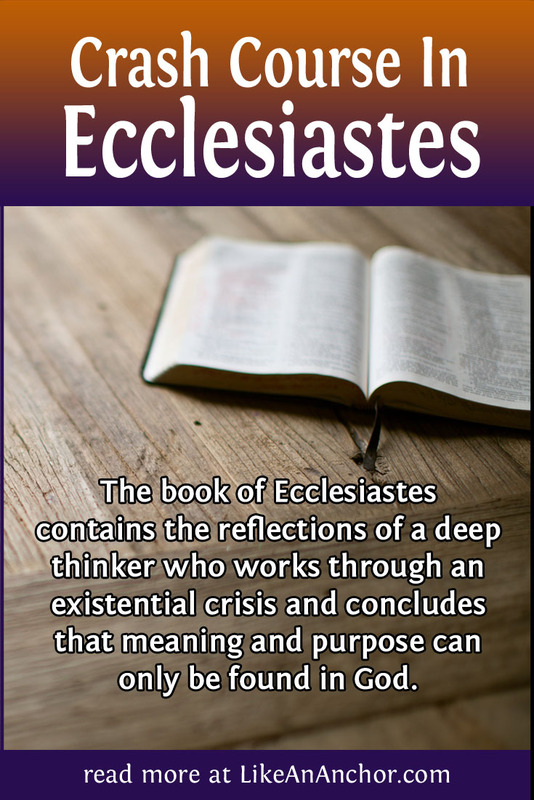 The book of Ecclesiastes contains the reflections of a deep thinker who works through an existential crisis. This sort of crisis happens when an individual starts to question whether their life (or life in general) has any purpose, meaning, or value. Solomon wrestled with these questions and records his thoughts for us to learn, as he did, that true meaning and purpose can only be found in God. 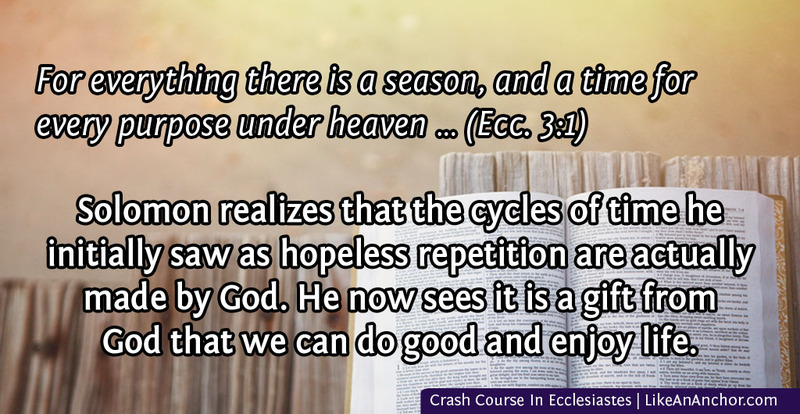 Ecclesiastes is one of those books that it’s not a good idea to read isolated pieces from. That’s one way you end up thinking there are few spiritual lessons in this book or misinterpreting its message. The whole thing is interconnected, with layers of thoughts building on each other as Solomon goes back and forth asking questions and contemplating possible answers. It’s vital that we look at this piece of writing as a whole before we start to dive deep into individual passages. “Vanity of vanities,” says the Preacher; “Vanity of vanities, all is vanity” (Ecc. 1:2 ,WEB). Thus the book of Ecclesiastes opens, and Solomon will repeat this phrase throughout and in the conclusion (Ecc. 12:8). He presents everything in life as vanity, or hebel (H1892) — a vapor/breath; a transitory or unsatisfactory thing. That might seem like a depressing outlook, but can you really look at the world and say he’s wrong? Do things of this life last? Do they make sense? Is this world satisfying? Not on its own. With a few thousand more years of history to look back on than Solomon had, we can see the truth of these statements. Nothing really changes. We’re not advancing toward a utopia. People just keep making the same mistakes over and over again, which looks to Solomon like cycles of futility and meaninglessness. Oh, there are technology advances and improvements in our lives, but people stay the same. Having come to this conclusion about life, Solomon tries to resolve his existential crisis by looking for some kind of meaning. He says, “I applied my heart to seek and to search out by wisdom concerning all that is done under the sky” (Ecc. 1:13). He indulged in all sorts of sensory pleasures, amassed wealth, and created created great things but it was also vanity. Next, he tried out wisdom and folly to compare the two, and found “that wisdom excels folly as far as light excels darkness” (Ecc. 2:13). But the wise and foolish both die. They can’t keep what they worked for or guarantee what they leave behind will have any effect. At this point, Solomon “hated life” and says, “I began to cause my heart to despair concerning all the labor which I had labored” (Ecc. 2:17, 20). Even realizing that you can have wisdom, knowledge, and joy in your life if you please God seems to him like “vanity and chasing after wind” (Ecc. 2:26). But now we come to the first part of Solomon’s ruminations where he glimpses hope. Solomon realizes that God is the one who made the cycles of time. What Solomon initially saw as hopeless repetition he now recognizes as beautiful (Ecc. 3:1-11). Solomon sees that it is a gift from God that we can do good and enjoy this life. He knows that God has a plan in place and that the righteous and wicked will be judged (Ecc. 3:12-17). Existential crises aren’t that easy to resolve, though, and Solomon still has questions. He’s accepted that God has a purpose for how the world keeps on turning. He knows that this life can be seen as a gift. but what about after you die? In Ecc. 3:18-22, Solomon concludes that humans die just like animals, and who knows whether their spirits really go to different places? Maybe this life is all we have and we should just make the most of it. But that’s not a satisfactory answer either, since not everyone gets to enjoy this life. People oppress each other, and the oppressed have no comfort. People envy each other, live lonely lives, and there’s no end to the people who keep being born and dying in this fallen world. Solomon even suggests it would be better to never be born than to live and see all the evil that fills this world (Ecc. 4:1-16). Immediately, the conversation turns. Solomon says, “Don’t be rash with your mouth and don’t let you heart be hasty to utter anything before God” (Ecc. 5:2). Perhaps he knows that’s what he’d been doing, as his thoughts ran away with fears and questions. Solomon knows God has a plan and the times are in His hands — he just needs to find a way to trust Him. He desperately wants to make sense of what’s going on in his life, in the world, and in the afterlife (if there is one). As we continue in chapter 7, Solomon counsels to avoid extremes. Even a good thing like wisdom can drive you crazy if you “make yourself overly wise” (Ecc. 7:11-2, 16). We can’t make sense of everything or know the future (7:23-25). “There is no man who has power over the spirit to contain the spirit; neither does he have power over the day of death” (Ecc. 8:8). Because this is true we need to beware of hasty judgements, offenses, and conclusions. Rather, focus on fearing God (Ecc. 7:18). The latter part of chapter 8 and into chapter 9 seems like a step backward. Solomon was talking about it being “better with those that fear God” but then he remembers “that there are righteous men to whom it happens according to the work of the wicked. Again, there are wicked men to whom it happens according to the work of the righteous” (Ecc. 8:14). This frustrating situation sends Solomon right back to commending mirth, then reapplying his heart to wisdom trying to figure things out (8:15-16). He concludes that “man can’t find out” the work of God no matter how much he seeks it, nor comprehend God’s plan and thoughts even if he is wise (Ecc. 8:17-9:1). Solomon even starts to question whether there’s purpose in death or not because he’s still wrestling with the fact that the same things happen to both righteous and wicked people (9:2-6). I think most (if not all) of us can relate to this. Just because we think we’ve figured something out doesn’t mean nothing will shake our faith. Gross injustice, friends who die too young, tragic health trials — they can all make us question the frame through which we see the world. The fact that Solomon keeps going back and forth, asking the same questions and wrestling with the answers makes him very relatable. We’re approaching the end of the book now and Solomon presents a revised conclusion: that we should live life to the fullest even though it’s absurd. We can’t predict the future, we can’t control anything, and we’ll be better off if we just live well and try not to overthink things (Ecc. 9:7-12). Of course, overthinking things is something we humans are very good at. Solomon continues comparing wisdom and folly, and continues coming up against the conclusion that wisdom is far better. Chapter 10 reads much like part of Proverbs, and it leads into the final conclusions of Ecclesiastes. Practice wisdom. Remember “you don’t know the words of God who does all.” Don’t get distracted or complacent. Keep working and living (Ecc. 11:5-6). Balance is key — rejoice in all your years but also “remember the days of darkness” that help give perspective. Remember that “God will bring you into judgement” for all you do, so put off both sorrow and evil (Ecc. 11:8-10). He’s now speaking most pointedly to young people, urging them to “remember your Creator” today, before life gets harder or trials come or you grow old and full of regrets (Ecc. 12:1-6). Here at the end is where Solomon finally answers his earlier question, “Who know the spirit of man, whether it goes upward?” (Ecc. 3:21). Solomon has reached the point where he has a confident assurance that there is life after death and God will sort-out everything that doesn’t make sense now. I suspect, and Matthew Henry’s commentary agrees, that Solomon wrote this in old age, hoping that his young audience would heed his wisdom without feeling the need to themselves experiment with life as he did. Solomon shared what he learned from wresting with questions and doubts so others wouldn’t have to. This also seems to be when he put together the book of Proverbs (Ecc. 12:9-10). As Ecclesiastes wraps up, he admonishes young people not to study too widely, for not all the information out there is good (12:11-12). Better to stick with “the words of the wise” which “have been given by one Shepherd” (Ecc. 12:11, TLV). It’s so nice to have such a straight-forward conclusion at the end of such a deep, complex book. 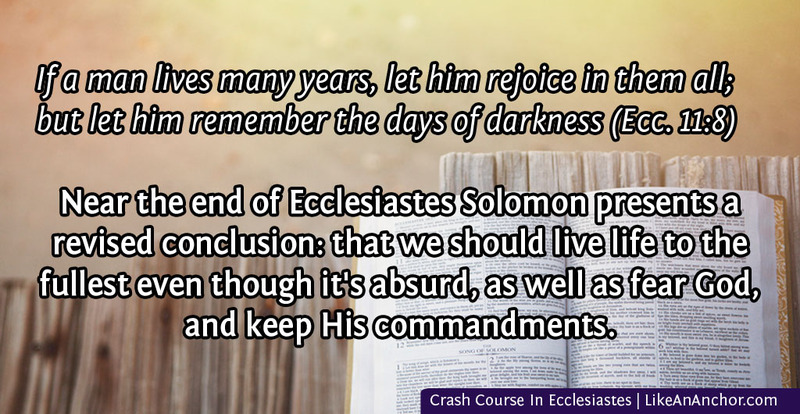 Here, Solomon tells us in no uncertain terms what the point of Ecclesiastes is. From it, we’re to learn that fearing God and keeping his commandments is man’s whole duty and that God will judge all our works.